At this point, it’s no secret – there are numerous health benefits associated with ballroom dance. Many enjoy ballroom dance for its art and culture; some because they entertain quests at formal events so dancing is a must have; and some dance for the fitness and competition aspects alone. But, do you realize that our senior citizens can benefit in many ways, not only from the physical conditioning aspect, but in the social aspects as well? Please allow us to share with you.. 1.) Improves Overall Physical Condition – Dancing improves overall muscle tone and strength, flexibility, agility and endurance – all of which become weakened as we age without having some form of routine exercise, especially without an exercise that engages the entire body like ballroom dance. Preserving, if not improving, bone density and joint health is also an added benefit for seniors due to ballroom dance being a weight-resisting activity while forcing the dancer to resist their partner’s body weight while dancing. And, the wonderful thing about Ballroom Dance is that each lesson is tailored around your abilities. Dance instructors are brilliant when it comes to recognizing each person’s current physical limitations and working from that point to build upon physical activity and dance skill. 3.) 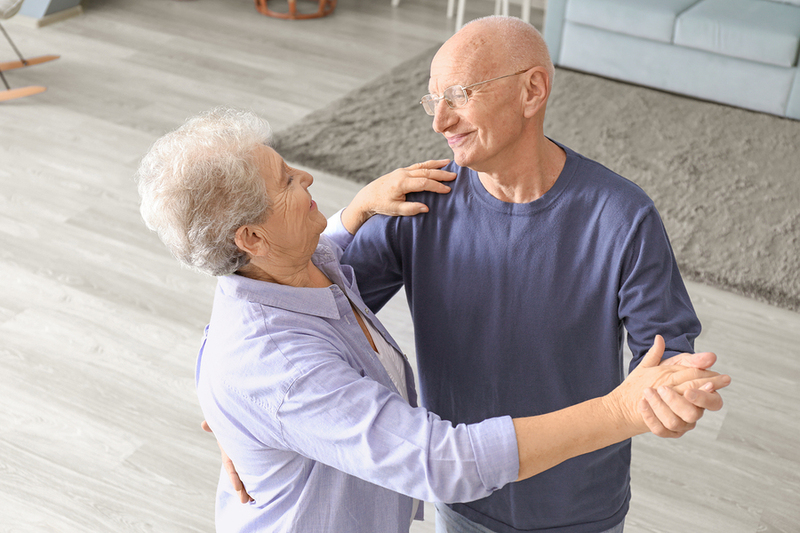 Helps Reduce the Risk of Dementia – As we previously reported in the article “Ballroom Dancing Makes You Smarter”, research from the New England Journal of Medicine found that dancing was the only physical activity associated with a reduced risk of dementia. Not only is it fun and engaging for seniors, it requires use of their cognitive thought processes which is extremely important in the risk reduction for dementia. 4.) Encourages Sociability – Loneliness in the elderly, especially ones living alone, is an ongoing concern for many families, and can have serious effects. As brought to light in Lori Wengard’s article, “Effect of Social Isolation on Aging Adults“, “28 percent of seniors 65 and older live alone. According to statistics obtained in 2014, approximately half of women 75 years of age or older live alone. They might be alone secondary to divorce or spousal death, or they may have never been married. Older adults may also live a long distance from their grown children. Being alone puts aging adults at risk of becoming socially isolated, which poses several mental and physical problems.” Isolation can create depression, cognitive decline, chronic illness, and reduce longevity to name a few as highlighted in the article as well. Not only is taking ballroom dance lessons fun and engaging, it provides seniors a very important outlet to be with others, thus encouraging more sociability. There are students of all ages learning the same dance steps together, and the tendency is they relate to their classmates and do not feel isolated or as alone while taking classes. Plus, if the studio hosts themed weekend dance parties like a social dance club features, senior citizens quickly begin to look forward to attending the special weekend events and are usually eager to participate and celebrate what they’ve learned together with other members. We sincerely love and appreciate our senior citizens, and hope to do our best as industry representatives to help them find healthier, happier and more fulfilled lives. If you’d like to dive into some specific reasons why our Seniors are in fact so special, we invite you to read, “Why seniors matter — and how they contribute to our everyday lives” written by Verena Menc. She points out some beautiful reminders for us all on just how special our older generations are and how much they continue to give to our world. Be sure to give this a Like if you enjoyed and share it with those you love. If you’re interested in seeing if ballroom dance class and it’s multitude of benefits might be for you or a loved one, consider this your personal invitation to our next Open House Night. We’d love to have you attend. You are welcome to bring a friend or partner if you’d like… but NO PARTNER IS NECESSARY! Feel free to reach out if you should have any questions… Call 678-653-8003 or email us at marietta@celebrityballroomdance.com.